Three Kings - thanoscardgamess jimdo page! This is a fishing card game in which the players try to get three Kings to use it as a scoring bonus. 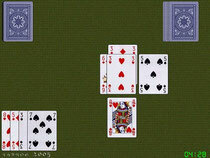 Four cards are dealt to each player, and four are turned face up on the table. To start each turn, a player draws a card. Then, if he can form a set of three cards, one from his hand and two from the table, of which two add up to the third, then he removes those three cards from play, puts them in a pile near him, and draws an additional card. If he cannot form such a set, he discards one card from his hand by placing it face up on the table. Then the turn is over. A game invented by Jimmy Kaplowitz and JC Ravage.